Yesterday was dance night for the girls, so Wooly Wednesday for me! It was a snowy and chilly night here, so it was perfect to be cuddled up in a nice warm library working on my wool project for a few hours. I am still working on my wool BOM, "Hop to It." My goal is to have my wool blocks complete by January. I am finding I love each month more than the last month. Block #4. I love the rich colors of the wool. Lisa Bongean's hand dyed Primitive Gatherings wool is some of the best I've seen. Block #5. I still need to stitch around his nose and give him an eye. I received a piece of perle cotton with my kit to use specifically around his nose and for his eye, but of course I've lost it! Again, the colors are so rich. I've enjoyed every second of making this project. I'm still trying to put out Christmas decorations. I have so much!! The girls just love it all! More is more to them, so that's what I do. They notice every new ornament or Santa I put out. 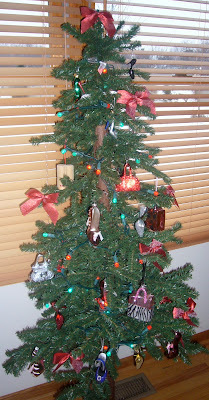 We decorate the tree together, but I do most of the rest of it. I love to see their little faces light up when they come home from school and see more decorations out! So far I have four trees! One big, three small. 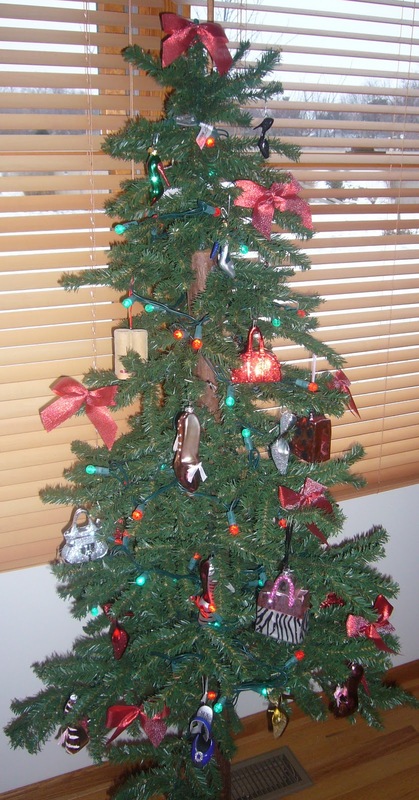 I have one tree dedicated to my love of shoes and handbags! Scott surprised me with this a few years ago. I can't remember what they are called, but the heat from the candles make the Nativity Scene spin. The girls just love to watch it! Good Morning Linda! I love, love your wool blocks....so pretty. The little shoe ornaments are adorable! Your wool blocks are just wonderful! Christmas is coming to your house! Looking great! I love your wool blocks! You're a gal after my own heart, Linda! I love Primitive Gatherings wool - and you make it come alive! Beautiful blocks! I see we're also both decorating - I have much more to go....what fun! I love working with wool and saving my good textured ones for sewing projects. I had a spinny thing too and it got ruined over the years, really loved it. The wool blocks are beautiful!! Hop-to It is one of my favorite books - maybe one day I'll start. I thought I recognized those blocks. A applique group I am in is going to be doing a block a month using that pattern. Your wool is fabulous. I am going to be using a line of fabric from Moda called Martinque. Fantastic work. Love those wool blocks. Your home looks cozy and reminds me to get moving with Xmas decorating. With the kids out on their own, I tend to procrastinate. Merry Christmas! I adore your wool blocks! That wool does look very wonderful!! I am still getting caught up from being off line over Thanksgiving. Your wool work is awesome! Is that the Edyta Sitar pattern? Your decorations are really pretty! I love your wooly blocks. Your decorations are looking great, specially the shows - I've never seen anything like those before. Love the wool blocks and such a contrast from wool to the glitz of your shoes! Fun! I know a gal who also collects fun shoes! I have to show her this post! !